Today, everyone is upgrading. We’re upgrading our computers, our phones, our devices. We’re making them faster and more effective, so they work at top speed and quality. Wouldn’t it be great if we could also upgrade our lives? Rabbi Zelig Pliskin shows us how to transform our thoughts and feelings, so we that we will instill a completely new pattern of optimism and confidence into our lives. 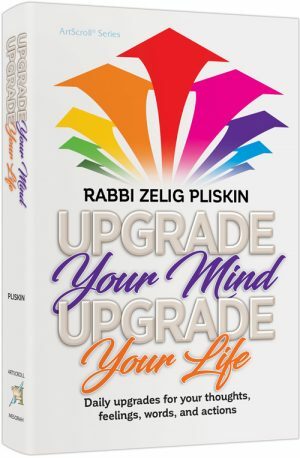 Each of his 101 “upgrades” includes an affirmation for us to repeat, insights both from classic Torah sources and from Rabbi Pliskin’s extensive work with coaching others, practical tips, and stories to show how people upgraded and improved their lives. You keep your devices working in top shape. Shouldn’t you do the same for your life? Let Rabbi Pliskin show you how.